Everywhere you look these days, there’s something that’s been designed to give you a chill. 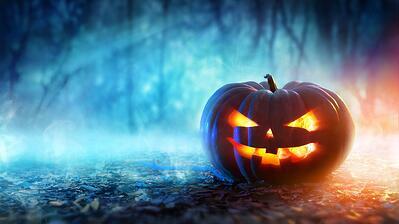 From spooky jack-o-lanterns to ghosts and witches to creepy clowns, it’s the scaring season. In less than a week, kids will be dressed up and invading neighborhoods across the country in search of treats. Where I live, we don’t get many trick-or-treaters. Those who do stop by get a friendly greeting – nothing too scary – and take home a big handful of treats. In some ways, trick-or-treaters are a lot like B2B leads. Depending on how you present your company and what you offer, they may be scared away before they ever ring the doorbell. The name of the game in B2B marketing is lead generation. Every marketer loses sleep over how to generate more, better-qualified leads. What many don’t realize is that some of their tactics may actually be scaring leads away. Here are six ways you may be doing just that. Just to warn you – I’m sticking with the Halloween theme. Enter at your own risk. We’ve all been to a website or received an email that tells us nothing but why XYZ company is the best. If you’re like me, you leave those experiences behind as quickly as possible. When a prospect finds you, it is usually because they’re looking for an answer to a question they have or a challenge they are facing. They are not looking for a narrative about you. It’s time to stop talking about the we dos and focus more on the so what. If you’re a regular reader of this blog, you’ve heard us talk about establishing a teaching point-of-view. Teach the problem you solve to your prospects. Make it all about them. Help them find the answers to their questions…not a list of your product’s or service’s features and benefits. My son had his first haunted house experience two years ago. He was a little nervous about going because he wasn’t sure what to expect. When he and his friends arrived, they were greeted by many scary monsters, ghosts, zombies, clowns, etc. They were also invited into the haunted stable, haunted corn maze and the haunted fun house. Before they were even close to getting into the actual haunted house, four of the six boys decided they didn’t want to go inside. Your website is at the center of your lead generation efforts. Invest in making it welcoming, educational and not something visitors will be afraid to enter. So we knew where to go to get the good stuff. We also knew where not to go. For us, the bad candy was the orange and black wrapped peanut butter taffy pieces. We avoided those houses where we knew that’s what they were handing out. Same concept applies when we’re talking about attracting leads. If you only give away meaningless content that isn’t helpful, your visitors aren’t going to come back. Don’t gate all of the good content. Let your visitors get a taste without ringing the doorbell. Chances are they’ll come back for more if what they read was helpful and will happily give up their contact info to get the next piece. One house in our neighborhood went all out for Halloween. They decorated inside and out, played scary music and invited the trick-or-treaters inside. (Yet another thing you couldn’t do today but back in the day…). While I liked Halloween and still do, I wasn’t super crazy about being scared. That house put me over the edge. I always tried to find a reason that we shouldn’t go there. The same thing can be said about landing pages. There’s a right way and a wrong way to create a landing page. If your copy does little to describe the offer or your form asks too many questions, your visitors will leave before they ever find out how great your content is. Keep landing page copy concise. Tell your prospects exactly what they will receive and what it will teach them or help them do better. The length of the form should coincide with the offer. Top of funnel offers should ask for minimal information. As your offers move through the funnel, increase the number of questions but do so thoughtfully. At Imagine, we strongly believe that an inbound marketing and sales development approach will deliver significant results…when implemented correctly. However, there are many mistakes that can be made. We have all experienced it…the immediate phone calls and emails after downloading a piece of content. When it is done well, those phone calls and messages can be effective. When it is done poorly, the person on the receiving end runs away…like they’re being chased by Freddy himself. Taking an approach that is too aggressive without the proper messaging or cadence will end any relationship before it even gets started. Sales development without a well-defined playbook is doomed to fail. Take the time to build a process and your leads will not confuse you with any bad guy from a horror movie. When you visit the pumpkin patch today, orange pumpkins are not the only option. Today there are white pumpkins, greenish pumpkins, bumpy pumpkins and of course, plain old orange pumpkins. Just like pumpkins, all leads are not the same. If you’re not managing your leads appropriately based on who they are and where they are in their buyer’s journey, they won’t be leads for long. B2B lead generation is hard work. It will always be a challenge but if you avoid scaring your leads away, you'll be in a much better position to succeed.